Minimal disturbances and proper trail-camera placement will help you pattern hard-to-find bucks. Tom Miranda once said, “Bowhunting is a conscious decision to make the hunt harder than it needs to be.” This unpretentious yet simple definition summarizes what we do. But why? One answer can be summed up in a word — challenge. When bowhunters take on a competition between themselves and a specific animal, the drive some of us encounter is a personal quest that no scribe could ever pen. We’ve all had specific bucks on our hit list that, despite our best efforts, humble us into submission. 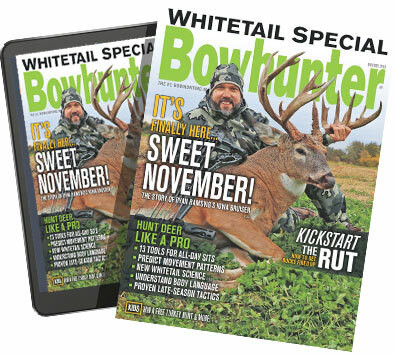 Although some may surrender, for many bowhunters, giving up isn’t an option. This obsession, or personal challenge we put on ourselves, is one reason why we do what we do. The thought of finally realizing our objective is the incentive that keeps us moving forward. Truth be told, so many times in life we fail. Yet, without setting goals and working hard, none of us would ever have the chance to proudly hold a trophy buck or doe. Biologists know that does are more territorial than bucks. Whether it’s defending a fawning area (where she kicks out last year’s fawns), or an area of prime habitat, does will almost always out-compete bucks for better quality habitat. This is one reason why some areas are devoid of bucks. If you’re not seeing bucks, the solution to your problem is simple — move your stand location. Biologists know a deer’s core area (where they spend 50 percent or more of their time) shifts throughout the hunting season. You should also move your stand locations to parallel a deer’s change in movements or core areas. To answer that question, Harper graphed the total number of unique bucks from his camera pictures for three weeks. He found that nearly 10 percent of bucks identified during the first five days of his survey were never seen again. Harper concluded, “Even if food is involved, some bucks will not put up with any human disturbance.” Chances are you have experienced the same observations. Why should you pre-bait with corn when many of the bucks in your area will leave as soon as you start baiting? Oftentimes, these bucks are the larger, more mature ones that we never see again. Considering that corn nowadays costs just under four dollars per bushel, eliminating any pre-baiting can save you some money. Who knows how many tons of shelled corn is put out each year to attract deer? On average, shelled corn has a protein count of about five percent. This figure is well below a deer’s minimum daily protein requirement, and as Harper says, “Shelled corn has never added one inch to any antler score.” However, corn does have its benefits. It’s low in calories and fat and provides carbohydrates (energy) to deer. Although shelled corn is an attractant to deer, it seems some bucks won’t put up with human scent or disturbance at bait sites. These days, it seems like more and more trail camera companies are now incorporating cellular technology into their cameras. This advancement allows you to check all your cameras from the comfort of your home or vehicle, thus significantly reducing or eliminating any potential human scent at camera sites. If bucks disappear a few days after starting your camera survey, what do you do? Are these bucks unkillable? If so, why don’t we find more evidence, such as skulls/racks in the woods? Considering the number of larger bucks that end up killed on the highways, or succumb to diseases such as CWD, EHD, tuberculosis, and predators, it would seem hunters are much more efficient than many people would think. Although many hunters are addicted to hunting over corn piles and setting up their camera at these sites, you may want to try something different. For example, try setting up cameras further back in the woods (say, 100 to 200 yards), where you do not throw out any corn. There is now ample evidence to show many larger, mature bucks enter a bait site, food plot, or corn/soybean field after dark, and leave prior to sunrise. If you hunt these food areas, you still can have success. But if you’re after a specific mature buck that’s nocturnal, hunting closer to his bedding area may be your only viable option. This is where a camera back in the woods, located completely away from a bait/food location, can pay off big time. It might take you some time to figure out a buck’s trail coming off his morning feeding, but he can be patterned. Yes, you may bump him, but remember, he will remain nocturnal unless you get closer to his bedding area. 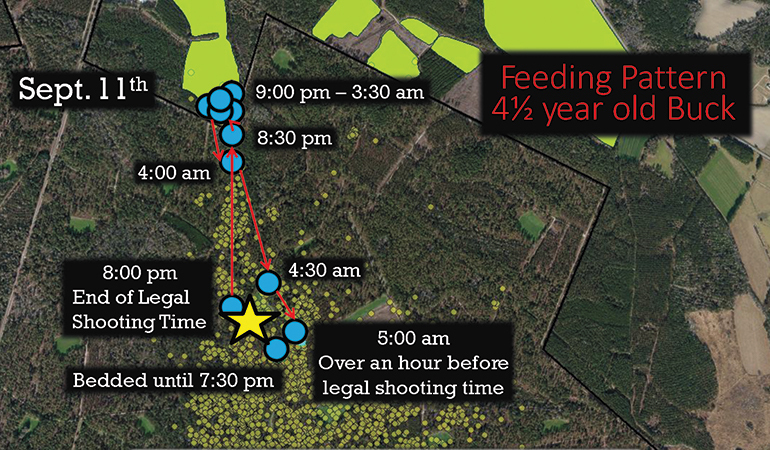 In addition to setting up cameras in non-feeding locations, getting to your stand two to three hours prior to sunrise has also proved beneficial to many hunters who hunt “outside the norm.” The question is, how bad do you want it? Although you may not be able to see anything at 4 a.m., oftentimes you can hear deer walking through the woods. Don’t be afraid to move closer to the sound for your follow-up hunt. Remember, minimal human disturbance to and from a treestand, and at food/bait sites, will maximize your chances of harvesting a dream buck.